Freemasonry is believed to incorporate some sacred number combinations and they seem to have something to do with the stars of Orion, The Pleiades and stars in Taurus. Click here Ref: Albert Pike 33 degree mason text. The information contained in the link above proves this unequivocally. The stars of Taurus the bull, the Pleiades, Orion and a special "blazing star" are all mentioned. However top ranking Masons generally believe the "blazing star" to be Sirius. Let us test the Masonic Sirius theory. First we will reason how the stars appear to be linked to the sacred numbers. Secondly, how the solution is another little astronomical viewing trick to remember how the real "blazing star" can be located. Here is a reproduced popular Masonic image with some valuable symbolism. 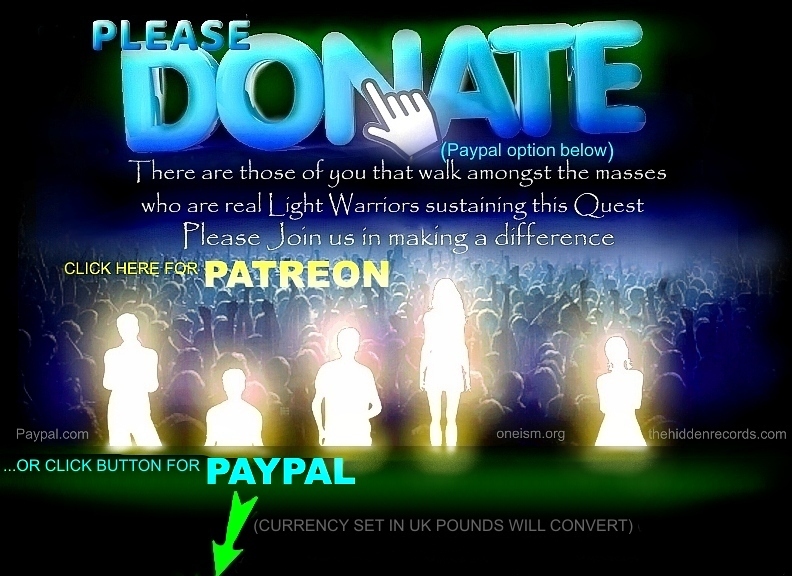 The image adds clarity to part of the sequence 3 - 5 - 7 and how the numbers lead towards the illuminated secret - shown 'in the heavens'. The first thing that one should question is how would numbers be of any measurable value if the secret involves stars? Secondly if the solution involves the use of numbers to identify constellations then what would it be leading the initiate towards? 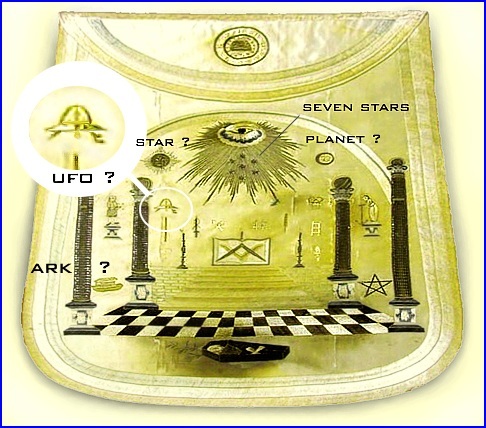 The only rational answer here would be if the numbers were finding the way to an important star in the heavens... a star associated with the solar deities revered in all ancient civilizations and in the case of Freemasonry… the "blazing star". If there is a measurable star sequence at hand, then one can solve the identity for the "blazing star" mystery. Is it Sirius as many Freemasons believe, or is it another that is more Sun-like if one accepts the premise that the celestial gods were real Solar deities of flesh and blood? Let us start with what astronomers refer to as the cosmic signpost: Orion's famous three in a row 'belt' stars, the most recognizable stars in the night sky. Logically this would be our point of departure. The number seven, as the Freemasons suggest, is synonymous with the seven stars of the Pleiades. That leaves the number one and number five. 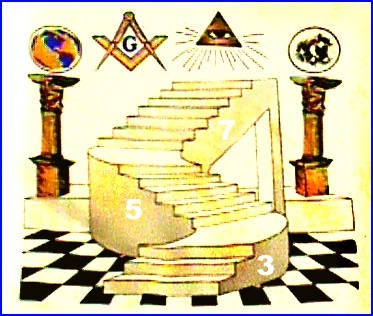 The image of the staircase suggests that the number five is in the middle. This matches with the Roman numeral V, which is the shape, the stars of the Taurus constellation form and which also appear as five stars. The number sequence now joins three constellations in a row. The ultimate question is this: Do we start with the sacred number one or do we work our way up towards the sacred number one? Here is what Wayne has reasoned: The image suggests that we begin with the three stars in a row. 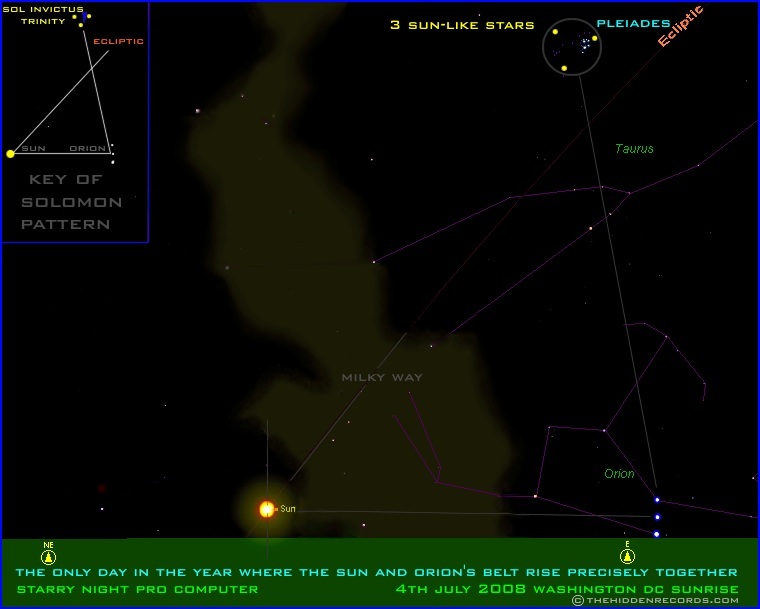 As stars, the three 'belt' stars of Orion show the way in alignment through the five stars of Taurus... through to the seven stars of the Pleiades, to find the ultimate star. This is traveling with our line of sight away from the star Sirius. The ultimate star is very tiny, and impossible to see with the naked eye! Small wonder that the Masons figured the solution needed to be Sirius as the "blazing star"! This explanation that Wayne ventures as an alternative to the Freemason's "blazing star" becomes quite logical in the context of his bigger picture star map theory, and has made sense in each and every one of his star maps so far, where the special star of the ancients is always found in the direction that the Pleiades 'leg of the bull' points to. If the grand secret involves extraterrestrial beings that once arrived on this world (our human ancestors from another star system) then did Washington leave any other clues proving how they got here? George Washington has presented so many clues that it is certain he wanted people of the future to crack his code. His story would not be complete until it depicts like the ancient civilizations some kind of celestial ship of those that came from above. This now begs the million-dollar question: Did George Washington have ancient knowledge that also included the celestial ships of the gods? What are the odds of finding an image or proof of some sort depicting what we would class today as a UFO... a ship of the sky that does not originate from this Earth? Where else could we search for either a journal or some form of record where he the once American president would have been able to depict his own interpretation of how our ancestors arrived here? There probably is no secret book passed down from president to president, but there is one special medium with which he could have expressed himself, as a Freemason. He would have had his own personal Masonic apron. It does exist, and yes, there appears to be something embossed on it that could be interpreted as a UFO as we know it. Here is a one more thing to think about on Wayne’s Washington DC star map theory. Consider another critical reason behind George Washington's motivation to build the United States’ capital in the way it is depicted in the main image above. It stands as the only modern monumental star map layout visible from space on our planet. Look carefully at the proverbial "x" that marks the spot on the star map. It is the grand obelisk, the Washington Monument. If our cosmic ancestors officially decide to visit one day... and IF all our world leaders change their military protocol completely from chasing UFO's to shoot them out of the sky, to a protocol where we let them be, what appears to have been deliberately built with such an impending visit in mind, is an identifiable official landing site built exactly like the Inca Cuzco 'landing' site theorized by Wayne. An 'invitational' area so to speak seems to have been provided for such a 'visit' and it is also in the perfect shape. It lies between the great Yule tree and the Washington Monument obelisk… the two ultimate markers on either side of the massive round field highlighted in red. And quite peculiarly, this site may well be the very same field used in one of the earliest science fiction films to re-enact a story of a UFO landing! The layout of Washington DC also clearly depicts and cryptically 'shows the way' to the position of the residence of the world Super Power leader, along its beautiful causeway and secret symbols: The most cryptic of which is the crescent shaped garden around the Presidential residence, the Capitol - perhaps symbolic of the planet of the ancestors. In the coming weeks Wayne will be releasing a 4500 year old Egyptian papyrus that shows this identical artistic impression of a UFO, a papyrus that depicts the cosmos, the Pleiades and more compelling than anything else... where it landed in Egypt! Watch this website for more. Some say George Washington was the founder member of the order of the skull and bones that George Bush apparently belongs to, but this is purely speculation perhaps interpreted from the insignia on the apron. In 1848, the breaking of ground cornerstone of the Washington Monument obelisk was celebrated... on the 4th of July. The Declaration of Independence was signed and celebrated on this day too. Since then, Americans have celebrated the day with an illumination ceremony... fireworks displays. 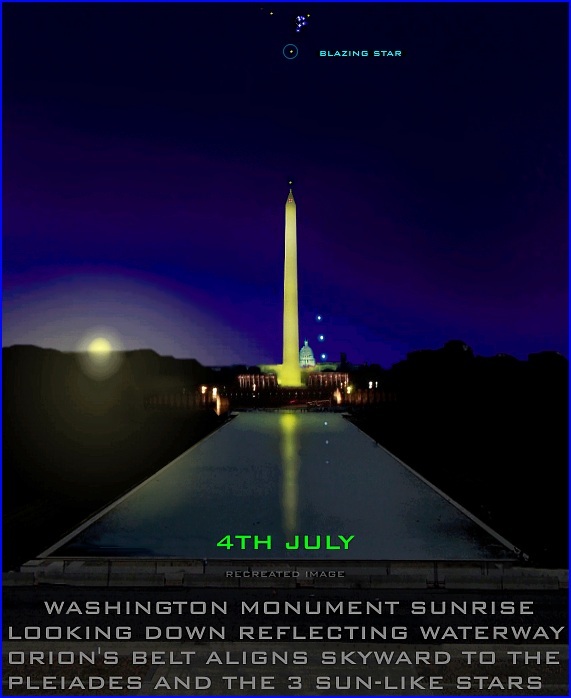 Not only does this ceremony occur annually at the Washington Monument, but also at the statue of Liberty in New York. It is a day that begins with an important rising star formation on the horizon that occurs exactly the same moment as sunrise. The Ancient Egyptians celebrated the rising of important stars on the eastern horizon across the Nile River and would probably have known this special date. What is becoming quite evident in Wayne's research is that the same is true for all the other ancient civilizations. They too revere the rising of important stars when they rise at the exact same time as the Sun. The star program recreates the positions perfectly. Note how the ecliptic path of the Sun, as well as the Sun alignment with Orion's Belt and the line up towards the sacred star near the Pleiades also recreates the strange pattern found in the Dollar bill seal and on the Solomon talismans shown earlier. The pattern in the sky is reflected in the waterway… as if beckoning the observer to look in the heavens. The pattern in the sky IS the solution to the Key of Solomon. The very same star pattern occurs on Christmas Eve in Rome down the causeway above the Castel Sant Angelo, the star castle in Dan Brown's 'Angels and Demons' that Wayne identifies in another shocking star map celebration. 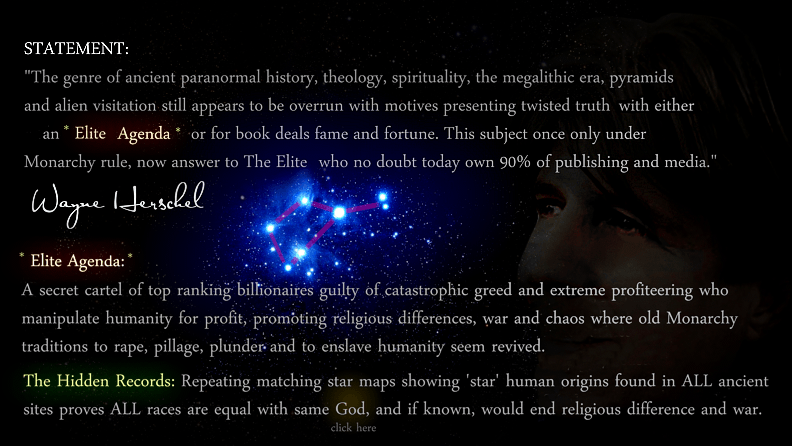 Click here Ref: Vatican star map. In the interest of Dan Brown's new book getting history right, Wayne has sent his star map research material (predominantly the Solomon Key star map and Vatican star map theory) to Dan Brown's literary agent in New York offering it to Dan as reference so the important meaning is clear and that it has already been released. This was late in 2007. Certain that Brown would be anxious to get history right, all Wayne asked him to do is mention the reference source as any other author would if he decided to use it. After a few phone calls and discussions Heide Lange wrote back and mentioned that Dan was completely 'incognito' and unable to receive any mail no matter of what importance it may be deemed. The exact date Dan Brown is to launch his new book, probably titled 'The Solomon Key', has not yet been released. He did however say it would be on a very important Masonic day fitting his story. Did he get to see the new material sent to him? Will he make the same connections? Or will he reinterpret it all in an entirely different way? Instead of identifying the 4th of July, Dan has chosen another important date only found encoded on the solomon talisman... the 15th of September. 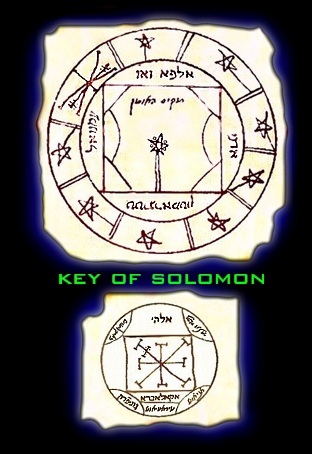 The most exciting breaking story right now is how this story connects to the record of what appears to be the predominant and most ancient Hebrew talisman - listed also as the Key of Solomon (image directly below). The 'key' to deciphering the talisman appears to be the smaller talisman shown below it. It contains what looks like an image of the earliest rendition of The Sacred Cross. The Solution connects this Washington DC story to Stonehenge in more ways than any other. 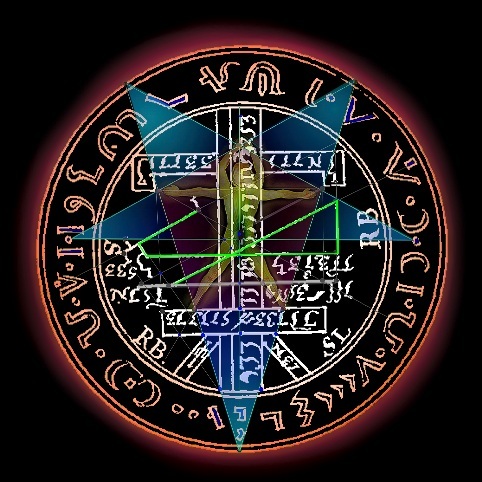 Wayne's deciphering of 'The Key of Solomon' is currently being published in magazines internationally and as soon as the scheduled articles have released in American and British magazines the full story will be online at: www.KeyofSolomon.net.